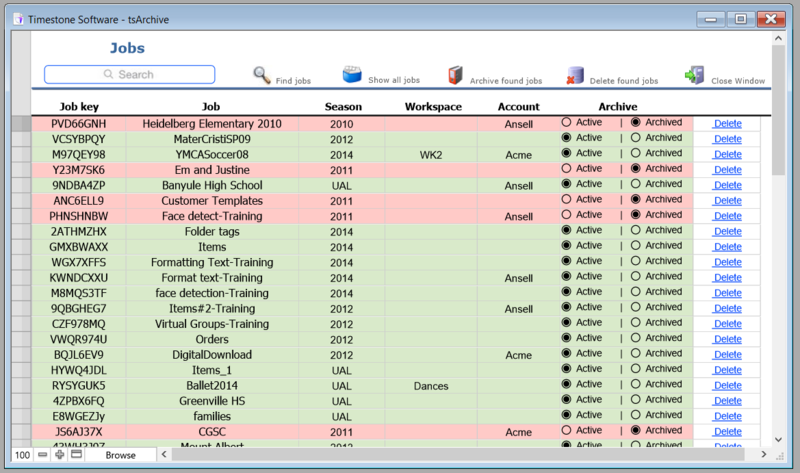 tsArchive is a utility to help manage jobs in your MySQL database. It allows the user to 'swich off' or 'archive' jobs without deleting them from the database. Essentially archiving a job means it will not appear in the File>Open window in the production applications (NeoPack etc) nor will it appear in the list of jobs when uploading a job to the Internet Ordering System. Since from year to year, season to season, users may end up with multiple jobs with similar names, archiving the older jobs means it is impossible to mistakenly open or upload the wrong job. Archiving a job also removes the image previews from the database. Thumbnails and previews account for approximately 90% of the database size therfore archiving jobs will help keep the overall database size relatively small. This is an important factor with regards to hard disk space and backups. The archiving process is completely reversible. Using tsArchive, jobs can be unarchived at anytime meaning they will again appear in the File>Open and tsIOS upload windows. And by refreshing the job's images, the image previews will be regenerated. In addition to archiving jobs, tsArchive has the ability to delete jobs. This functions is password protected and should be used with care as it completely removes jobs from the database and is not reversible. The list below summarises the key functions of tsArchive. Jobs may be easily 'unarchived'. Due to its nature it is highly recommended only the main Timestone operator in your operation uses tsArchive. It is envisaged tsArchive will only be used sparingly - perhaps at the end of a year or season (to archive old jobs) while the need to unarchive old jobs will be minimal. Once Filemaker Pro is downloaded and installed the installation of tsArchive is performed by Timestone Software staff. This is a simple process that requires access (via Teamviewer or GoToMeeting) to the Filemaker computer and the MySQL server. Customers already using a later version of tsPortal will not need this initial installation and will be able to use tsArchive straight away. tsArchive employs a simple single screen interface which for the most part is self-explanatory. The main section of the tsArchive window lists jobs together with their Job Key, Season, Workspace, Account and archive status. The toolbar is ued to perform functions such as finding jobs and batch archiving. The quick search window performs a free text find in all the fields in the tsArchive window. Jobs may be archived in two ways. Along with the colour coding (red-archived, green-active) a job's status is indicated by the Archive column in the job list. This column is also a selector, allowing the user to toggle between archiving and activating jobs. To archive an active job simply click the 'Archived' selector. To activate it, click the Active checkbox. Be patient when archiving large jobs especially those with lots of images. This can take some time. To bulk archive several jobs in one step (perhaps all the jobs in a particular season for example) firstly perform a find so only the jobs you wish to archive appear in the main window. Then click the 'Archive found jobs' button in the toolbar. It is only possible to bulk archive jobs once a search has been performed. This is a safeguard to ensure you cannot archive all your jobs at once! Before bulk archiving confirm the found jobs are indeed the jobs you wish to archive. Jobs may only be unarchived individually using the Archive selector in the job list. It is not possible to bulk unarchive jobs. Once a job has been unarchived it will reappear in the File>Open list in the Timestone applications such as NeoPack. Note however it will not recreate the image previews that were deleted in the archive process. However this does not mean the images will not be visible when working with job. Provided the software can find the original images, the thumbnails and previews will be generated on demand as needed from mode to mode. The above will make the job slower to work with since previews are generated 'on the fly' whenever you enter and re-enter the modes that display image previews (Images Mode, Poses Mode, Queue Mode, Point n Click Mode, Item Sheets Mode). This is not an issue if your intention is to only spend a little time in the job. Perhaps all that is needed from this unarchived job is to re-print a package for example. However if more time and work is needed with the job, and the slowness is an issue, it is recommended refreshing all the images in Images Mode. This effectively reimports the images and regenerates the image thumbnails and previews once again saving them to the database. If more than one image preview size is defined the refresh process should be performed for each size if that size is needed. tsArchive also has the ability to delete jobs from the database. This completely removes all the job's data and cannot be reversed. It should therefore be used with extreme caution. Note the ability to delete a job is also present in the software itself such as NeoPack. Since this forces the user to export the job to tnj first it may be a more prefereable option than using tsArchive for deleting jobs. tsArchive does not export the job to tnj before deleting it. Since 90% or more of the space occupied by a SQL job in the database is due to its image thumbnails/previews, there is arguably little need to delete jobs. Archiving the jobs instead keeps the data and means the job can be accesssed in the future. Deleting jobs could then perhaps be reserved for when you finally delete the job's images from your image server. As with archiving jobs, bulk deleting of jobs is only possible if you have performed a find first.